 Our 10th Anniversary Supermap of Airports, Seaports, Railways and Highways.  How new AIRPORT SECURITY plans impact the future of travel and tourism.  Features from our Award Winning 6th Annual Exotic Destinations edition.  Reports from 6 Aviation and Travel Industry leaders.  Airline profiles including several "New kids on the block."  Adventure Travel in the International Year of Ecotourism.  Web Site and E-Mail Directory of Aviation and Transportation contacts.  Update on our APEC '97- Asia Pacific Markets edition.  Abbotsford International Airshow's 40th Anniversary Souvenir Section.  Preview of COTA'S Annual Tourism Conference.  Looking at Globe 2002 Business and the Environment. 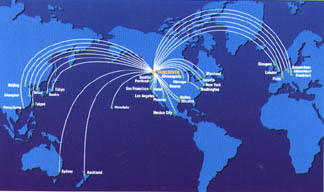  Air Harbours of Vancouver, Victoria, Prince Rupert and Seattle.  World Air Cargo Association and company profiles.  Air Harbor Technologies , a new star on the international horizon.